Tomato is a very common vegetable and we are using the same daily. 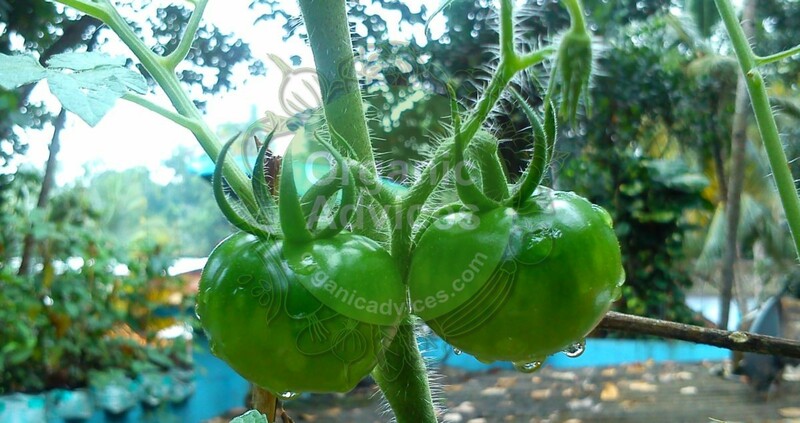 It very easy to cultivate tomato using complete organic methods. Tomato should be in your home kitchen garden or if you are looking for a vegetable garden you should include it. Cultivation of tomato is very simple and it didn’t need much care. Seeds are using to produce tomato plants. The main problem in tomato cultivation is Bacterial Wilt. Lot of people facing this issue and we can easily overcome the Bacterial Wilt of Tomato. You can check from here how can you control the Bacterial Wilt of Tomato using only organic methods. High amount of acidity in soil is the main reason for Bacterial Wilt. You can reduce the amount of acidity in some easy methods. Quick-lime can be used to reduce the acidity of soil. you can use this method also in grow bags, while making the potting mix put a handful of Quick-lime in grow bag and mix well . please be note that plant the tomato seedling only after 2 weeks. it may take some some to control the soil level. This will control the acidity of soil and we can prevent Bacterial Wilt of Tomato. Pseudomonas fluorescens is another solution to control the Bacterial Wilt of Tomato. You can dip tomato seeds in Pseudomonas for 6 hours before seeding it. Pseudomonas is available in liquid and solid formats, liquid is more effective but its costly. take 2-3 grams of Pseudomonas in 50 ml of water and keep the tomato seeds for 6 hours. Then you can seed it on seeding trays or grow bags. You can use Pseudomonas once in 2 weeks and it will help the growing of tomato plants and prevent diseases. Please be remember that do not use any chemical fertilizers or pesticides along with Pseudomonas. You can use other organic fertilizers to grow the tomato plants. We have posted the list of some useful organic fertilizers here. fish amino acid is an effective organic fertilizer in tomato cultivation. it will give micro nutrients to the plant and will help in more productivity. we have posted about fish amino acid preparation and usage here. You can check it out and read about the making of fish amino acid organic fertilizer. hi thanks for the easy solutions to control the wilt in tomato. i have searched for a lot regrading this issue and will try this methods. how can v make ‘chakirichorvalam’ at hom? Sir…how can we prevent leaf curl?